Leaves are arranged spirally around the stem in a dense rosette pattern (see Coppens d'Eeckenbrugge and Leal, Chapter 2, this volume). This shape and orientation channel light rains and dew to the base of the plant, making a significant contribution to the water economy of the plant (Ekern, 1965, 1968). Large trichomes completely cover both adaxial and abaxial leaf surfaces (Fig. 5.7), and a highly cutinized upper epidermis and a multicelled hypodermis are two significant morphological and anatomical features of pineapple leaves that contribute to the plant's water economy (Krauss, 1930, 1949; see Coppens d'Eeckenbrugge and Leal, Chapter 2, this volume). There are 30-35 tri-chomes mm-2 on the abaxial leaf surface (Aubert, 1973), which cover strips of stomata located in furrows between ridges devoid of stomata (Fig. 5.7). There are relatively few stomata per unit leaf area (70-85 mm2) and the stomatal pore is small (Krauss, 1949; Bartholomew and Kadzimin, 1977). is chlorenchyma. This water-storage parenchyma functions as a reservoir of water, which is utilized during periods of drought. The depleted tissue is replenished after adequate rain (Krauss, 1949; Sanford, 1962). As noted previously, these morphological and anatomical features result in low evapotranspiration (ET) (Ekern, 1965) and extreme tolerance to drought. Transpiration values of 1.3 mm day-1 on cloudy days and 2.7 mm day-1 on fine days, average 2.1 mm day-1, were obtained for 15-16-month-old fruiting pineapple plants (Shiroma, 1973). In a pot study in sandy soil, transpiration was maximum during the summer when temperature and solar radiation were highest (respectively about 27°C and 10-12 MJ m-2 day-1) (Shiroma, 1971); a low value of 0.4 mm day-1 was estimated during the coldest periods. Average ET values for 'Smooth Cayenne' pineapple in field experiments in Hawaii were 0.83 mm day-1 with a plant-trash mulch and 1.25 mm day-1 with plastic mulch (Ekern, 1965). For a leaf canopy formed by small plants (LAI = 4.2) during fruit development, daily maximum ET was 1.3 mm on cloudy days (irradiance = 10.7 MJ m-2) and 2.7 mm on a sunny day (irradiance = 16.6 MJ m-2), with an average of 2.1 mm day-1 (Shiroma, 1973). Measurements of ET made in Côte d'Ivoire (N'Guessan, 1985) showed that values decreased from 0.25 mm h-1 over a 10 h period 5-6 months after planting to 0.11 mm h-1 per 10 h period 7-10 months after planting. However, ET in Côte d'Ivoire can reach 4.5 mm day-1 when solar radiation is high (Combres and Perrier, 1976). With irrigation, ET averaged 3.0 mm day-1 over a 2-month period (Combres, 1979). 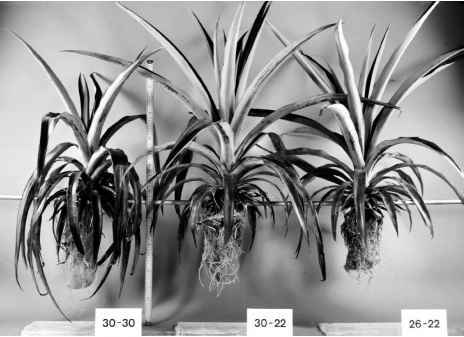 Despite the high resistance of pineapple to drought, effects of drought on plant morphology and growth are important. In a dry season, the width of young leaves, the rate of leaf emergence and the weight of successive 'D' leaves may be reduced (Py, 1965). 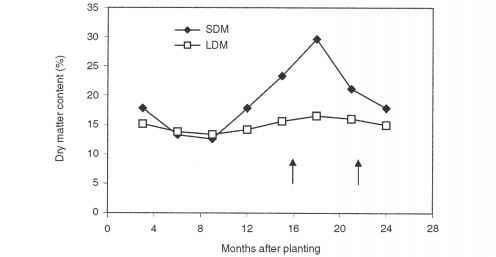 In Hawaii, leaf elongation decreased when the soil moisture content declined below 30-35% (Ekern, 1964). During the dry season in Côte d'lvoire, water content was less and specific leaf area (SLA) (g m-2, fresh weight basis) was greater in unirrigated than in irrigated crops (E. Malezieux, unpublished results). The symptoms of drought develop slowly, the earliest being reduced growth and wilting of the older leaves (Swete Kelly and Bartholomew, 1993). With severe and prolonged drought, leaf colour changes from dark to pale green, then to pale yellow and finally to red. At the later stages, leaf margins curl downward, leaves lose their turgid-ity and become limp and growth stops (Py et al., 1987; Swete Kelly and Bartholomew, 1993). The effects of drought are reversible and, when water again becomes available, the leaves rehydrate and normal growth resumes. Leaves not yet fully expanded resume their growth. Leaf width rapidly increases, resulting in a constriction at the point where elongation resumed (Py et al., 1987). Such leaves generally develop spines on the margins at the point where growth was restricted. Symptoms of water stress may appear more rapidly where soil waterholding capacity is low, if rooting depth is restricted or if the root system has been damaged by pests or disease (Swete Kelly and Bartholomew, 1993). Leaf and plant temperatures of this relatively non-transpiring crop reach values that are detrimental, perhaps even lethal, to meso-phytic crops. The temperature of horizontal leaves of 6-month-old 'Smooth Cayenne' plants reached 48°C between 1 and 3 p.m. in Hawaii (Aubert and Bartholomew, 1973). The difference between the leaf middle and base reached 18°C and the maximum difference between leaf and air temperatures was 18.6°C at 1 p.m. Such extreme leaf temperatures caused no permanent harm, but their specific effects on physiological processes have not been studied. As discussed previously, the effects of temperature on stomatal conductance are significant. The effect of temperature on growth is quite complicated. The morphology of 'Smooth Cayenne' plants is markedly affected by temperature. Optimum nutrition in environments having a controlled night temperature greater than about 25°C and in warm, humid, low-altitude climates near the equator produces plants with numerous, wide, flaccid leaves (Fig. 5.8; Py et al., 1987; Bartholomew and Malezieux, 1994). Conversely, in controlled environments with cool night temperatures (Friend, 1981) and in cooler climates, leaves are erect, straight, rigid, shorter and fewer in number (Fig. 5.8; Py et al., 1987; Bartholomew and Malezieux, 1994). In Hawaii, leaves of plants grown in high, cool elevations are shorter and more rigid than those on plants grown at lower elevations. Indices such as SLA (leaf area per unit of leaf dry mass, m2 kg-1) and leaf area ratio (LAR) (leaf area per unit of total plant dry mass, m2 kg-1) allow the effects of temperature on plant morphology to be quantified and extend our ability to predict the effects of environment on vegetative growth. Whole-vegetative-plant SLAs over time were consistently lower for plants grown at night temperatures of 18, 22 and 26°C than for those grown at 30°C (Fig. 5.9). The lowest SLA was about 3.8 m2 kg-1 dry weight at a day/night temperature of 22/18°C (Bartholomew, 1982). SLA declines gradually as plant mass and age increase (Fig. 5.9), especially at the cooler night temperatures, so comparisons of SLA between plants in different environments must be made using plants having approximately the same mass. least to some degree, is the fact that plants growing in cooler environments have a higher net assimilation rate, which would offset to some degree the benefit imparted by a more rapid rate of leaf expansion that would occur in warm environments. Thus, dry-matter gain by plants in cooler environments may be as high as that which occurs in warmer environments, where leaves expand more rapidly. Unfortunately, simultaneous changes in other climatic factors as temperature changes, possible differences in the growth rate of 'Smooth Cayenne' clones and differences in quality of management make it very difficult to compare productivity across environments having different temperature regimes. where SLA is expressed in cm2 g-1 and T in °C. The relatively low R2 values for equations (4) and (5) are assumed to be due, at least in part, to the decrease in SLA and LAR with increasing plant mass and age. In contrast to many crops (Biscoe and Gallagher, 1977) and regardless of the air temperature, the leaves of the pineapple mother plant persist at least into the first ratoon in Hawaii, a period of more than 24 months. However, the functionality of pineapple leaves of various ages has not been adequately determined. Both the 'Smooth Cayenne' pineapple leaf and stem are important storage organs and can accumulate large quantities of starch. 30°C, plants had lower dry-matter content and little starch in the stem, while plants grown at night temperatures of 18 and 22°C had significant amounts of starch (Bartholomew and Paull, 1986). 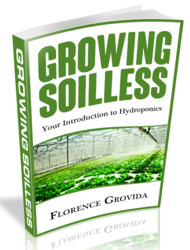 Plant dry-matter and starch content are believed to be especially important after floral induction (see Bartholomew et al., Chapter 8, this volume). While stem starch levels at the time of floral induction can be as high as 60% in Hawaii, starch levels do not reach 20% at the time of forcing in Côte d'Ivoire, where temperatures are higher. Forcing occurs much sooner after planting in Côte d'Ivoire than in Hawaii, because suckers are the primary source of planting material and vegetative growth is more rapid in the warm environment. Because the LAR increases as night or average temperature or both increase, large differences exist between statistical models of vegetative growth developed in Hawaii (Fleisch, 1988; Zhang, 1992) and in Côte d'Ivoire (Malézieux, 1991). though such changes are relatively small, when total storage per unit of land area is computed, the accumulation is significant. In an unpublished study conducted in Hawaii (Pineapple Research Institute of Hawaii, personal communication), the starch content of leaves sampled early in the morning averaged about 0.25% for the first 400 days after planting. Starch then gradually increased to 1.27% at 570 days after planting (120 days after forcing). At that time, plants had accumulated an average of 254 g m-2, land-area basis, of starch in leaves. Both stem and leaf starch declined sharply after floral induction, presumably as reserves were drawn upon to support fruit and sucker growth. 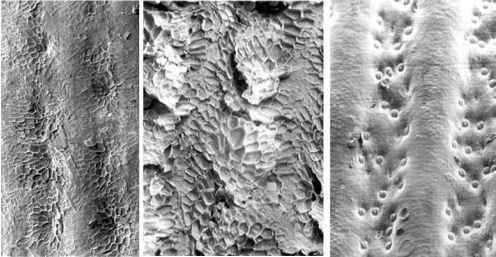 In tropical environments, little starch is accumulated in plant tissues by the time of forcing, so growth of fruit and propagules such as suckers, is dependent on current photosynthesis. In these environments, propagule development is delayed until after the fruit is harvested. (Ravoof, 1973). Also, as root temperature increased, the percentage of dry matter allocated to leaves increased from 77 to 80%, while that allocated to stem decreased from 17 to 13% (Ravoof, 1973). Plant LAR probably increased as root temperature increased. The spectral properties of the adaxial surface of pineapple leaves over the wavelength range from 520 to 750 nm were not significantly different from those of wheat, olive, orange and peach (N'Guessan, 1985). However, pineapple leaves have very low reflectances in the infrared region with minima at 1440 and 1990 nm (water peaks). Despite reflectances in the visible range comparable to those of mesophytes, much of the radiant energy falling on a pineapple plant is entrapped by multiple reflections within the rosette leaf array (Ekern, 1965). As a consequence, the total reflectance of the canopy is low (Ekern, 1965), resulting in canopy albedos that ranged from 0.14 to 0.16 for canopies ranging in age from 1 to 16 months (Shiroma, 1973; Combres, 1983). There was no significant variation in albedo with canopy height (N'Guessan, 1986). Estimated canopy light extinction coefficients for pineapple are typical of canopies with a relatively erect leaf orientation. Extinction coefficients (k) of 0.56-0.59 were calculated for 'Smooth Cayenne' pineapple in Hawaii (Fleisch, 1988; Zhang, 1992), resulting in 95% light interception at an LAI of about 5.0. Extinction coefficients for meso-phytic crops typically range from 0.4 for erectophile canopies to 0.8 or greater for planophile ones (Russell et al., 1989). 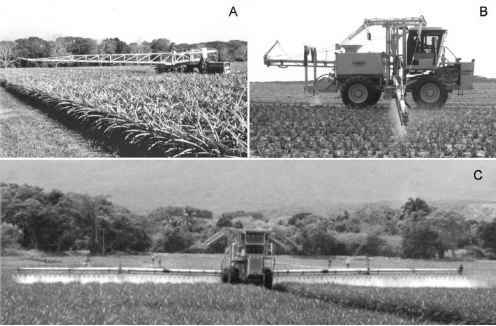 A significantly lower k of 0.29 was found for pineapple in Côte d'Ivoire by measuring total radiation interception of pineapple crops with a somewhat wider row spacing (Malézieux, 1991). Low k values account in part for the ability of pineapple to sustain very high LAIs. The data on the effects of photoperiod and irradiance are sparse and few useful generalizations can be made from them. Also, changes in these parameters in natural environments are often confounded with temperature. At low light, seedling leaf lengths decreased as the PPF increased from 100 to 325 ^mol m-2 s-1 (Aromose, 1989). Average leaf length was greater in 16 than in 8 or 24 h photoperiods (Aromose, 1989). At an average PPF of 400 ^mol m-2 s-1, the length of the longest leaf of plants grown for 692 days in controlled conditions increased as pho-toperiod increased from 6 to 10 h, was unchanged at 12 h and declined sharply at 16 h (Friend and Lydon, 1979). The width of the longest leaf increased continuously with increasing photoperiod while leaf thickness (g cm-2, fresh weight basis) declined (Friend and Lydon, 1979). In natural environments, leaves of plants grown in low irradiance are long, erect and dark green, while those of plants grown in very high irradiance become red or even yellow (Py et al., 1987). Physical damage and death, typically referred to as sunburn, due to high irradiance was reported in India (Srivastava and Singh, 1971). Connelly (1969) found that average 'D'-leaf length was 52 cm in full sun, 55 cm in 25% shade and 50 cm in 50% shade. What is adaptation featire of pineapple? What is the storage organ for pineapple?